Why Stockholm Is Beauty on Water! It’s dark inside Ekstedt restaurant, in the centre of Stockholm. In contrast to the moody lighting, however, is the buzz of animated conversation and the sound of crackling fires. The spitting image of Sir Jaime Lannister greets us with a big broad smile, exclaiming “Välkommen!” (‘welcome’ in Swedish). Walking into this Michelin-starred restaurant is like stepping inside the noir scenes of hit show Game of Thrones. We — my Toronto-born 21-year-old nephew and I — are about to gorge on a six-course dinner that is offered as the only alternative to a four-course one. And so, my foodie friends, these are the delicacies we sampled: cold smoked mackerel, kohlrabi and pine. Dried deer, vendace roe and charcoal cream. Pike perch baked with juniper, green peas and horseradish. Hay-flamed dairy cow, cabbage and salsify. Birch-fired pork, turnip and lovage. Wood-fired oven-baked almond cake, rhubarb and herbs. My nephew later described it as ‘very forest and very elemental’! Very GOT? In fact, very new Nordic nosh! 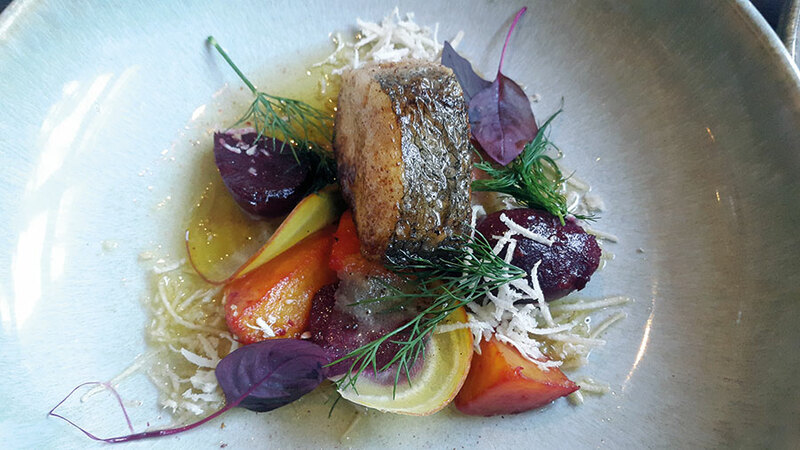 Chef Niklas Ekstedt rejected electricity in favour of wood-fired ovens and wood stoves to imbue his creations with authentic smokiness. His embrace of 18th-century traditional style cooking earned his restaurant its first Michelin star. The narrative of this bronzed and TV-star-handsome chef unspools like a Swedish film. “When I opened my first restaurant at the age of 21, the focus was on the then ultra-trendy molecular gastronomy, serving dishes such as asparagus cloud and deep-fried rice paper. But one day I felt the urge to return to my roots. What was I going to do? I was 33 and lost. In the eyes of the media and the public I was a lightweight TV chef. I roamed the land, musing like some melancholic character in a black and white Ingmar Bergman film. I was supposed to have set up a barbecue that summer, but that never happened. Instead, I chopped down some of the birches in the forest for firewood. Then I built a fire pit. The fire became the family’s kitchen that summer, hissing and crackling as the raw food went into the pan. What power, and what flavour! Finally, I felt I was onto something.” He certainly was for night after night, Scandinavians flock here to sample his food cooked in the stone-age style! Globally, Sweden is known for its style factor in every dimension. Let’s start at the Vasa Museum. Stockholm has wrapped a concrete museum around a 69 metre-long real wooden warship with its original 100 metre-tall masts jutting out of the building’s rooftops and reaching for the skies. Just like the Titanic, the unfortunate Vasa sank on her maiden voyage. That was way back in 1628. About 338 years later, the Swedes salvaged it in 1966 and spent the next 50 years painstakingly restoring the Vasa to its original glory. Over a million visitors from across the world visit the Vasa Museum to admire this unique art treasure housed inside a space half the size of a football stadium. I am aware that my jaw has dropped while eyeing the hundreds of carved sculptures that decorate this once-drowned remarkable antiquity. Luckily Stockholm, also poetically described as the Venice of the North, is not sinking. It is seamlessly spread over 14 lush green islands interconnected by bridges. That’s the most visible indication of Sweden’s legendary prowess in architecture and construction. 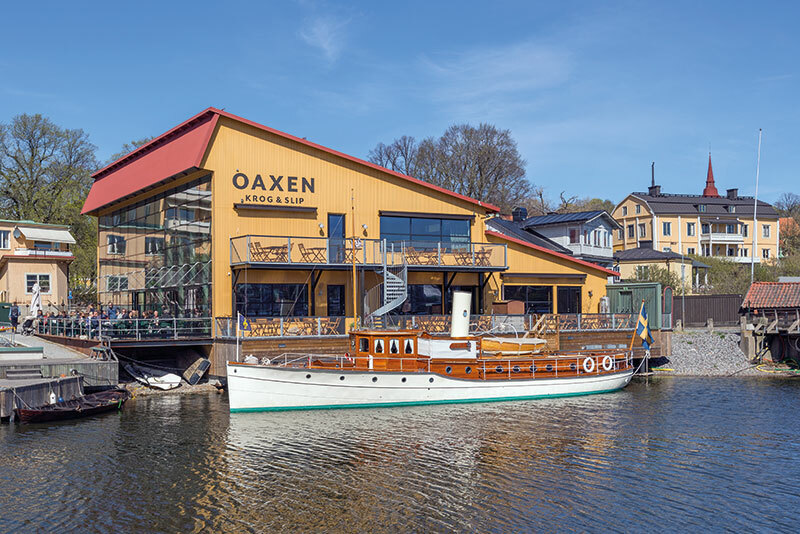 The Vasa Museum is situated on one of these islands called Djurgården which has many other attractions like ABBA The Museum, a large amusement park with adrenaline-pumping rides and the Museum of Spirits! The last named has a witty advert — ‘The best place for a museum dedicated to alcohol is between a wreck (the Vasa) and a roller coaster (referring to the amusement park)!’ The Museum of Spirits helps the visitor explore the complicated relationship between Swedes and alcohol! I absolutely loved their Absolut Vodka section and its clever branding over the decades. This waterfront museum, in a pair of refurbished navy sheds is not the first place you’d expect to find a groundbreaking chef. But the open-plan dining room, behind picture windows, turns out to be an inviting showcase for Chef Petter Nilsson’s bright and elegant food, which highlights the best local produce, direct from organic farms (or foraged in the woods around his home). His ever-changing lunch menu often features playful takes on traditional fare. We started with crisp dried mushroom with fermented ramson, fermented yellow beets, roasted sunflower seeds wrapped in beetroot leaf and salad heart from Skilleby dipped in soured cream and kombu algae. 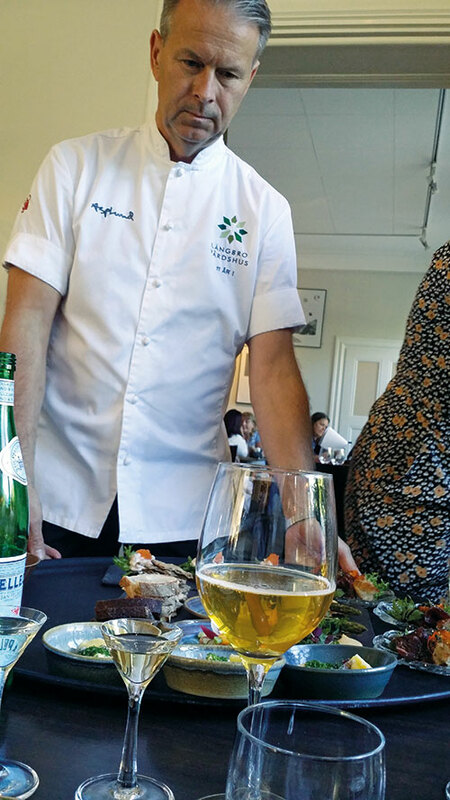 The first main course was lightly smoked pike perch, catfish roe and cress. The second main was cooked rare lamb with chanterelle, chard and sage. The desserts were ile flottante with rhubarb and bay leaf and almond tartlet with rhubarb cream. Dining on rich fare for lunch and dinner does have its consequences. So the next day, we walked into the ABBA museum and danced right through the many ’70s glitter rooms! Also serendipitously situated on Djurgarden island, this thrilling tribute to the band has on exhibit their music videos, clothes, lyrics, musicals and films in a permanent exhibition. It’s modern and interactive with soundproof booths in which we sang and recorded our vocals to some of their countless hits: Waterloo, Gimme Gimme Gimme, Fernando, Mamma Mia, Money Money Money and so on. 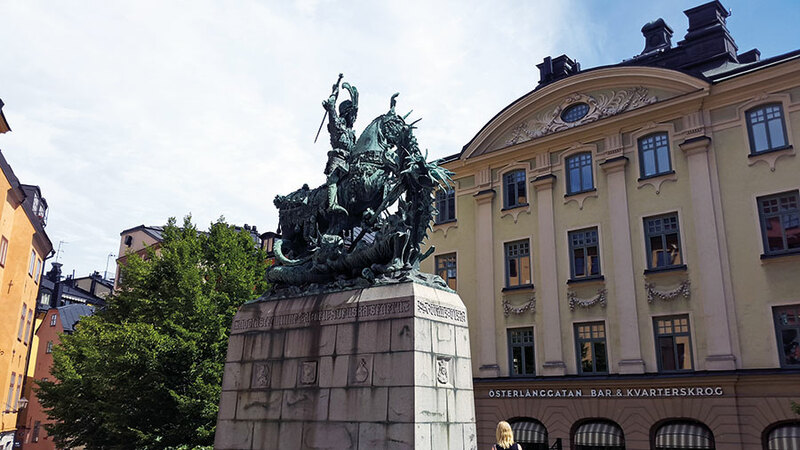 Kings and queens occupy a large part of Swedish history. Their lives can be discovered in Gamla Stan (old town) which is in one of the central islands, situated in the city’s very heart. It’s a Friday morning in June — hesitant summer sunshine, the promise of clear blue skies and Gamla Stan’s streets throbbing with life. On the pedestrian-only lanes of Gamla Stan, a hundred and one languages exclaim and exult over the sights, attractions, handicrafts, curios and souvenirs in this medieval inner city built circa 12th century. In the last 900 years, Stockholm has grown, expanded and added modernistic architecture around it but Gamla Stan remains unique. Its narrow winding cobblestone streets with buildings painted in shimmering colours reflect the sun’s rays in golden hues. 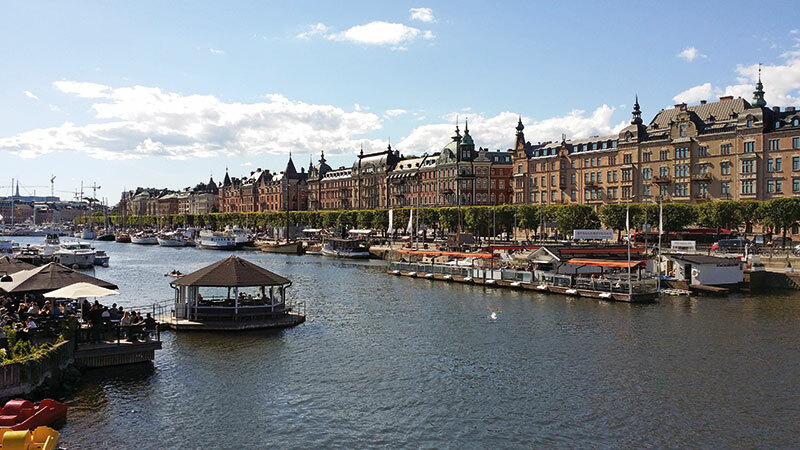 Gamla Stan is home to the Stockholm Cathedral, Nobel Museum, and the Parliament House, which proclaim their presence with their impressive sizes and facades. Here the imposing Royal Palace — the official residence of the royal family — with over 600 rooms beckons with a come-hither magnetism. Modesty was clearly not on the royal mind when designing and constructing this, one of the largest palaces in the world. Drum roll please for a partial roll call. Musicians that rocked the world at various decades — ABBA, Ace of Base, Roxette, Avicii, Swedish House Mafia. Silver-screen luminaries who seduced us — Ingrid Bergman, Greta Garbo, Anita Ekberg , Alicia Vikander, Dolph Lundgren, Max von Sydow and the inimitable director Ingmar Bergman. Tennis players Bjorn Borg and Stefan Edberg inspired new superstars. Author Stieg Larsson of the bestselling The Girl with the Dragon Tattoo series is also from here. Entrepreneurs without whom we would never have got Ericcson phones (Lars Magnus Ericsson), Ikea (Ingvar Kamprad), Skype (Niklas Zennström), Spotify (Daniel Ek). In so many ways these names have contributed to our lives. And then again there are the chefs whose creations have now helped Stockholm surpass Copenhagen as the best gastronomic destination in Scandinavia. Stockholm has indeed been an amazing experience. Let’s end with the only global award that really matters — the Nobel Prize. Alfred Nobel (1833-1896) invented dynamite and also owned (infamous in India) Bofors, the armament factory. As I stand inside the Nobel Museum, I learn that he held 355 different patents and why he was motivated to institute the Nobel Prize. His feelings were hurt by a premature obituary which condemned him for profiting from sales of arms and so he decided to bequeath his fortune to nobler causes. For us, even 96 hours in this 14-island archipelago of shimmering blue waters was too short a stay. Next time, the Aurora Borealis on my bucket list!